As manufacturing jewellers we take great satisfaction in creating something that has special meaning to our client, whether it’s traditional, contemporary or modern. Samples of stock designs that have been altered to our clients specifications. If a new design is wanted, likes and dislikes are discussed and a second visit may be arranged. Some time may be needed to create the best design outcome rather than rushing the process. At RARE EARTH design studio we frequently work as a design team bouncing ideas off each other’s understanding of what the client is looking for. ﻿ Many things in our lives are designed for particular uses. Jewellery is no different. There are times when a design that might be suitable as a dress ring may not be practical to wear every-day. How you will use your jewellery needs to be considered when deciding on a design. Informing our clients of the advantages and disadvantages of different designs and materials is an important part of our process. As we are manufacturers of individual jewellery pieces our clients frequently request pieces to be made that we have not manufactured before. Rather than quote a price at the initial visit we will analyse what needs to be done to achieve the desired outcome, then Email or phone with an estimate of the finished price. If we are sourcing a special gemstone this could be an unknown price factor. There are many different gems and their prices are constantly changing. These prices are effected by the availability and popularity of the stone, as well as the Australian dollar. To visit our shop click the shop now icon. 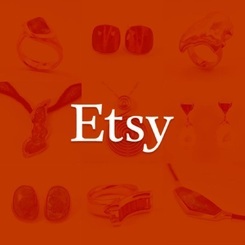 If you would prefer to shop on etsy click the Etsy icon.